Around here the snow has melted. The yard is in dire shape from a long winter. I've decided when the weather permits (today it was 70, yesterday 65) that I will work in the yard. Nicholas loves being outside and so do I. Yesterday I pruned all of our fruit trees, the are now ready to go. 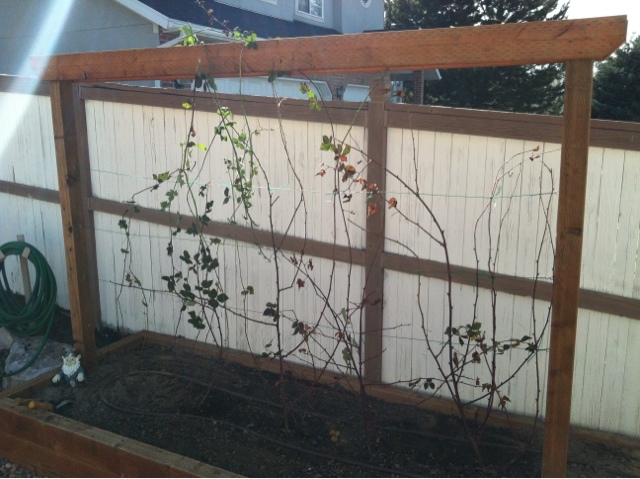 Today I set to work on weeding, pruning and setting the blackberries up to trellis. The plants were too small last year to trellis but as you can see they have grown. I hope to get a few pounds of fruit this year. If I do the yard in bite size chunks I might better maintain it this year. I do love the Internet and You Tube specifically. Thanks Internet! I watched many a video on pruning trees and various pruning techniques. While not a pro, I think I got the job done. In "Blackberries", "garden", "gardening", "yard"